Two off duty Peterborough cops caught a ‘green fingered’ suspect ‘red handed’ after stealing £132 of plants from Homebase, Peterborough on Friday. Anthony Laird, 33, of no fixed abode, described by police as a “prolific offender” was arrested on Saturday afternoon (April 9) on suspicion of taking plants from Homebase in Padholme Road, Fengate. Enjoying their day off, the officers noticed the man acting suspiciously just prior to him leaving the store in a vehicle. The officers quickly alerted their impact team colleagues who promptly located the vehicle and arrested the male. The stolen plants were recovered and returned to the store. 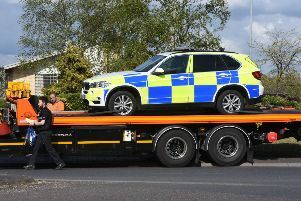 He was charged with theft from a shop and remanded in police custody before appearing at Peterborough Magistrates’ Court on Monday morning (April 11).